Click here to read the full text of the President’s speech. Click here to see the video. Click here to view the Climate Action Plan. Before Obama explained the details of his plan to cope with the changing climate, he emphasized how precious and fragile the planet is. 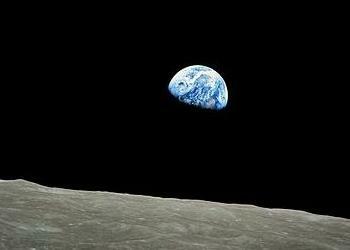 He recalled how as a seven-year-old child he was impressed by the first photograph of planet Earth taken from space on Christmas Eve, 1968 by the Apollo 8 astronaut William Anders. The plan covers enhancing appliance standards, developing heavy duty vehicle fuel economy standards and strengthening federal building efficiency, and limiting carbon emissions from electric generating facilities powered by fossil fuels such as coal and oil. Today, about 40 percent of America’s carbon pollution comes from power plants, Obama said, but today there are no federal limits to the amount of carbon pollution that those plants can emit. “That’s not right, that’s not safe, and it needs to stop,” he said. “So today, for the sake of our children, and the health and safety of all Americans, I’m directing the Environmental Protection Agency to put an end to the limitless dumping of carbon pollution from our power plants, and complete new pollution standards for both new and existing power plants,” the President said. 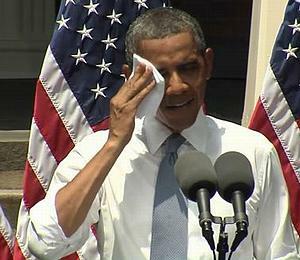 Within an hour of completing his speech, Obama issued a Presidential Memorandum to the head of the U.S. Environmental Protection Agency directing that carbon emissions from power plants be regulated. The regulation of new power plants must be formally proposed by September 2013, while the regulation for existing power plants must be proposed by June 2014. “A low-carbon, clean energy economy can be an engine of growth for decades to come. And I want America to build that engine. I want America to build that future – right here in the United States of America,” said Obama, expressing confidence that American businesses and American workers are equal to the task. For the first time, the President indicated that he might deny the Alberta-based TransCanada corporation a Presidential Permit to build the controversial Keystone XL tar sands pipeline across the Canada-U.S. border. Reaction to the President’s statement on Keystone XL was swift and wide-ranging. Senator Barbara Boxer, a California Democrat who chairs the Environment and Public Works Committee, said, “The President’s commitment today to only approve the tar sands pipeline if there is no net increase in carbon pollution is promising, but tar sands are one of the dirtiest fuels on the planet and the devil is in the details. We also need a price on carbon pollution,” she said. 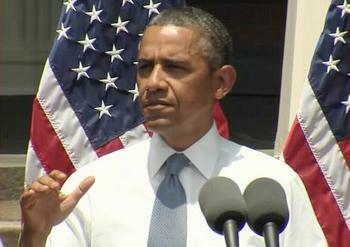 Obama said he would take action internationally to curb global warming. “My administration will redouble our efforts to engage our international partners in reaching a new global agreement to reduce carbon pollution through concrete action,” he said. He called for an end of public financing for new coal plants overseas unless they deploy carbon-capture technologies, or there’s no other viable way for the poorest countries to generate electricity. And he urged other countries to join this effort. “And I’m directing my administration to launch negotiations toward global free trade in environmental goods and services, including clean energy technology, to help more countries skip past the dirty phase of development and join a global low-carbon economy. They don’t have to repeat all the same mistakes that we made,” said Obama.